The “One Belt One Road” strategy is the abbreviation of “Silk Road Economic Belt” and “21st Century Maritime Silk Road.” In September and October of 2013, Chinese President Xi Jinping proposed to build the cooperation initiative of “New Silk Road Economic Belt” and “The 21st Century Maritime Silk Road.” President Xi Jinping projected to establish the “21st Century Maritime Silk Road” during his visit in Indonesia in October 2013. Finally, the National Development and Reform Commission, the Ministry of Foreign Affairs, and the Ministry of Commerce cooperatively issued the “Vision and Action for Promoting the Construction of the Silk Road Economic Belt and the 21st Century Maritime Silk Road” on March 28, 2015. The “One Belt One Road” countries were key areas of cooperation in the context of China's policy in communication, road connectivity, smooth trade, currency circulation, people's mutual understanding, strategic coordination to strengthen bilateral and multilateral teamwork, and corresponding development. The “One belt one road” strategy is the abbreviation of “Silk Road Economic Belt” and “21st Century Maritime Silk Road”. In September and October of 2013, Chinese President Xi Jinping proposed to build the cooperation initiative of “New Silk Road Economic Belt” and “The 21st Century Maritime Silk Road”. In September of the same year, Chinese President Xi Jinping delivered an important speech entitled “Promoting People's Friendship and Creating a Better Future” during his visit in Kazakhstan and proposed to build the “Silk Road Economic Belt” Jointly. President Xi Jinping projected to establish the “21st Century Maritime Silk Road” during his visit in Indonesia in October 2013. Finally, the National Development and Reform Commission, the Ministry of Foreign Affairs, and the Ministry of Commerce cooperatively issued the “Vision and Action for Promoting the Construction of the Silk Road Economic Belt and the 21st Century Maritime Silk Road.” on March 28, 2015 (The National Development and Reform Commission, the Ministry of Foreign Affairs, and the Ministry of Commerce, 2018). The “One belt one road” countries were key areas of cooperation in the context of China's policy in communication, road connectivity, smooth trade, currency circulation, and people's mutual understanding, strategic coordination to strengthen bilateral and multilateral teamwork and corresponding development. 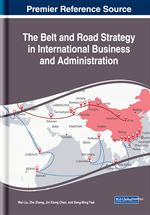 “One belt one road” strategy has a significant impact on the global economics. Firstly, the goal of the “One belt one road” is to establish a mutually beneficial interest, destiny and responsibility community covering through Eurasia countries. Secondly, “One belt one road” is the world's most promising, all-around, multi-level economic cooperation strategy, it originated in China, including Central Asia, Southeast Asia, South Asia, West Asia and parts of Europe. The east is connected to the Asia-Pacific economic circle. The west is closely related to the European economic circle. It covers about 4.4 billion people and has an economic aggregate of about 21 trillion dollars, which accounted for 63% and 29% of the world respectively (Gong, Tian & wang, 2018). Finally, the “One belt one road” strategy has created a new regional cooperation model, at the meantime, continuing to deepen cooperation with developed countries will strengthen cooperation with developing countries significantly by emerging powers and enhance the status of China (Luo, 2018).